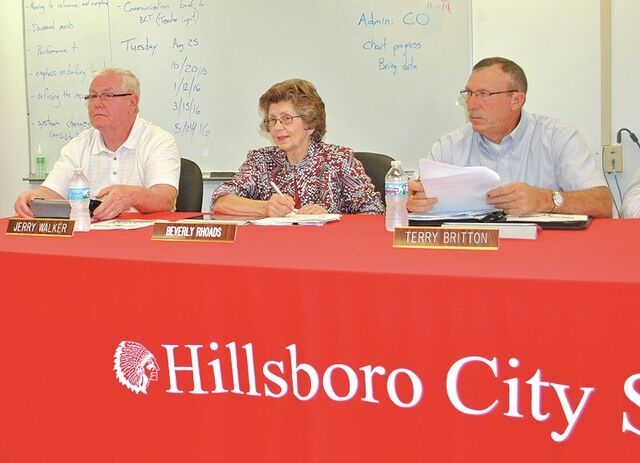 Hillsboro City Schools Board of Education members, from left, Jerry Walker, Beverly Rhoads and Terry Britton are pictured at Wednesday’s meeting. The school day for Hillsboro City Schools students will no longer start an hour later than normal on Wednesdays. Instead, the school day will now start at the same time each day and students will be dismissed an hour early on Wednesdays, after the board of education unanimously approved the move at Wednesday’s regular meeting. Smith said the school district considered a two-hour early dismissal twice a month, but that wasn’t enough time. He said he thinks teacher meetings at the end of the day will be more effective than at the beginning, and less complicated. But he also said there is downside because teachers will be more tired, and student-athletes will have longer waits after school until practice. The board approved handbooks for the elementary school and high school/middle school, but the latter was approved by a split vote. The big difference in the high school/middle school handbook, Smith said, is that students will be permitted 12 absences, plus any absences for doctor appointments, deaths in the immediate family, religious holidays, and other preapproved reasons, before they would face possible disciplinary action. Smith said new rule simplifies the process and that the district received help in establishing it from Highland County Juvenile Court Judge Kevin Greer. However, it was also noted that the judge said he would support nothing less. The superintendent said that on the 13th absence the student could face mediation or potential interaction with the juvenile court. Board member Jerry Walker voted against the handbook. Board members Sam Barnhouse, Terry Britton, Bill Myers and Beverly Rhoads voted to approve it. Smith said the new rule is a more practical way of dealing with attendance problems. During his superintendent’s report, Smith said the district is preparing to do a substantial amount of paving. He mentioned that gravel parking areas around the football stadium and a drain area on the former school campus will be paved. He said there will be more than $25,000 in paving around the elementary school, paving of bus garage fueling lanes, and that cracks in paving around the high school/middle school will be filled. Smith also said the new digital sign planned near the entrance of the high school/middle school is expected to be shipped on July 13 and should be installed by Aug. 1. He also said new signage is going up at the new soccer/track stadium. Walker reported that he’d like the board to consider directing someone to look into commemorating special performances by Hillsboro student-athletes, particularly the school’s several former track and field state champions. He said he’d like to see something erected in the area of the new track. “I’d like to keep that in front of students to let them know that high levels of success are attainable through (what we have right here) at Hillsboro High School,” Walker said. Smith said he thought it was a great idea. The board approved the purchase of 205 Chromebooks at a cost of $49,610. The district previously purchased 300 Chromebooks. Several athletic supplemental contracts were also approved including: Gary Breeden, assistant girls basketball; Nancy Coulter, reserve girls basketball; Chad Fields, eighth grade boys basketball and assistant football; Jacob Fouch, seventh grade boys basketball; Olivia Fulton, head girls cross country; Matt Hodge, weight room supervisor all year; Ryan Hopkins, eighth grade girls basketball; Adam McGinnis, reserve boys basketball; Glenn (JR) Moberly, girls gym coordinator; Jimmy Rhoades, head boys cross country; Matt Schneider, middle school boys and girls cross country; Alyssa West, assistant girls soccer; and Jennifer Willey, seventh grade girls basketball.